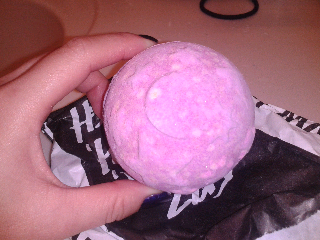 Today I will be reviewing the Twilight bath bomb from Lush. This product retails for $6.25 at Lush stores and online. According to their website, this "Peaceful Lavendar bathing under the stars recreates the magic of a starry night in your own bath water with clouds of lavendar and tonka absolute to fight the demons of insomnia and soothe your stressed out body and mind." It is also supposed ot change color from pinks to purples and darker. 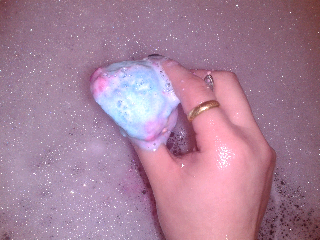 Now this bubbled up a lot more than just fizz out like most bath bombs i've tried. Then after awhile the pinkish purple outside dissolved revealing a sky blue inside. 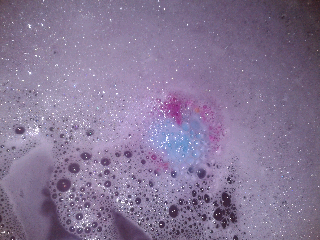 Now I must say I really love lavendar scents and found that there wasn't enough in this bath bomb. It is nice for those that don't like an over powering lavendar scent. 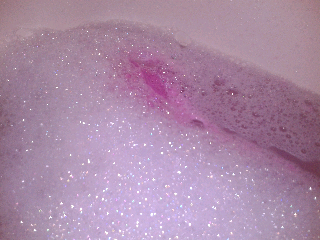 It was however very relaxing to bathe in and I found the bubbles and water to be very moisturizing to my skin.